EG Sale in London – Last Day….. So after work yesterday I finally got my chance to head over to the Edward Green pop up sale to see if there was anything that I could not live without. Just so happens that there was…..more than one, but only one being affordable for my bankroll at the current moment….They also had these in the midnight blue color in a UK7.5, a half size too big for me! Anyway, I have read a bit of reviews about the sale including happy and not-so-happy customers, and figured that I would give it my two cents. Apparently on the first day there were 2 hour queues and the weather was a classic crappy day with drizzling rain all about. This deterred many people from going in and thus not being able to acquire a beautiful pair of EG’s. All I can say is that I am sorry and that I can’t blame you because I would have done the same. However, things seemed to have died down since that Wednesday, with no queue when I went at 5:30pm, and there is still quite a bit of product. Let me rephrase that: there is still quite a bit of product, but MAINLY in the smaller sizes UK6-UK9. So if you are these size, it may behoove you to go back…. I cannot say that this will happen for sure, so don’t go quoting me, but if EG really wants to get rid of the stock, then it would not surprise me if today’s prices dropped as a consequence of that. But don’t go there thinking that this will happen for sure….it’s just my theory from knowing how these sales tend to work. That being, if you live in London (or close by), and did not yet get a chance to go, or tried but then left due to the horrendous wait times, then it just might be worth it to give it one last shot….I really did see lots of things that I would love to own, particularly in non-black/brown colors: e.g. green, blue and gray…..
What last are these beauties? 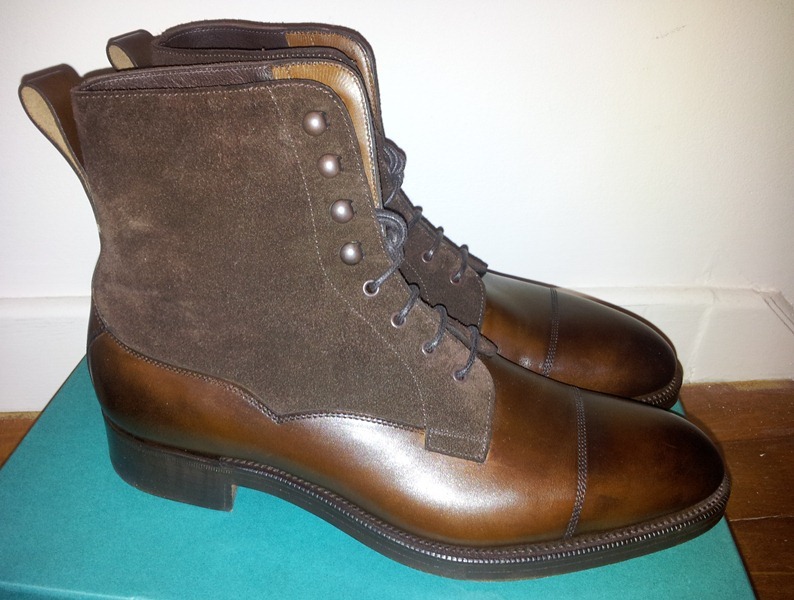 I see this style of boots quite often on your blog and in shops but wonder what is the advantage over oxfords or derbys? I feel stupid asking but would would you wear them with, surely not a suit but instead jeans? From the photo they would appear to come up much higher than a pair of chukkas – is that correct? I always think these boots look interesting but as I say, I wonder what i would do with them. Anyway congratulations on the find, they look like a great bit of leather and getting something at reduced price is always a great feeling. It seemed like they were topping up each day, and were able to go into the store to look for things if you had something in mind. 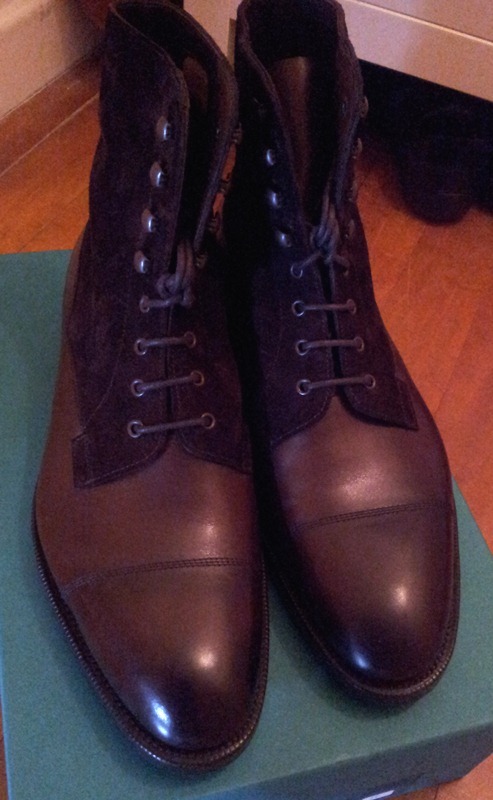 Alas the grain calf brogues I really loved were only in an extra narrow fitting. But anyway, it was worth a visit. I’m not sure, incidentally, where the “80% reductions” were – I didn’t see any myself. But 50-60% seemed the norm, and enough to be very tempting. Matt – You are right, this model here would not go with a suit, but rather jeans or dressed up in a smart casual sort of way, say chinos and a tweed blazer etc… And yes, these are higher than your average chukka boot which is usually considered a mid- heigh boot. 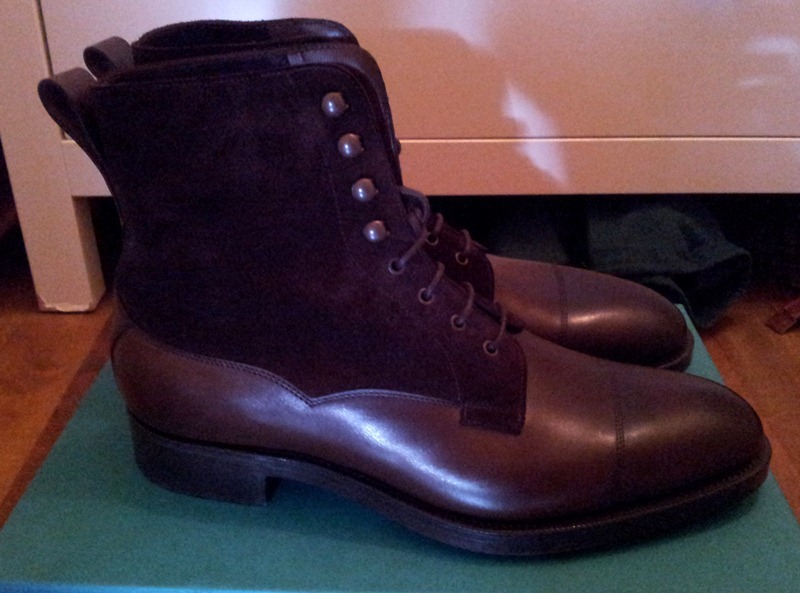 Now, on the other hand, I also put many balmoral boots on my blog, and these being an oxford style of boot are a bit dressier and if dressy enough could be paired with a suit, but this would need to be the right suit with the right boot and opinions will differ on this subject. I put them frequently on the blog, because I love them. They are not meant to be a substitute for a dress shoe but rather a complement to your smart casual wardrobe: think going out to a nice dinner and wanting to be comfortable yet not super dressed up. This type of boot could be your way-between. I hope that this makes sense. Thanks for kind words and for commenting. I will do that one of these days, Justin! On this occasion, I selected to use my few hours on a fantastic Iranian meal in Bayswater before wasting Edward Green’s time nearby instead! You know I’ve been kicking myself ever since for not buying those olive green slip-ons that I absolutely was NOT looking for! They did fit beautifully, even if they wouldn’t fit with many of my own clothes. Still, my children got bought new clothes last weekend instead, therefore probably for the best. So why is it I can’t stop thinking of ways that olive green shoes actually would have been a good idea?! I guess that’s the “Edward Green Effect”! Anyway, next time I’m in London for a day or a few hours at least, I’ll come and waste time in G&H and say hello – might even talk myself into believing I can afford something by Carreducker…perhaps not!